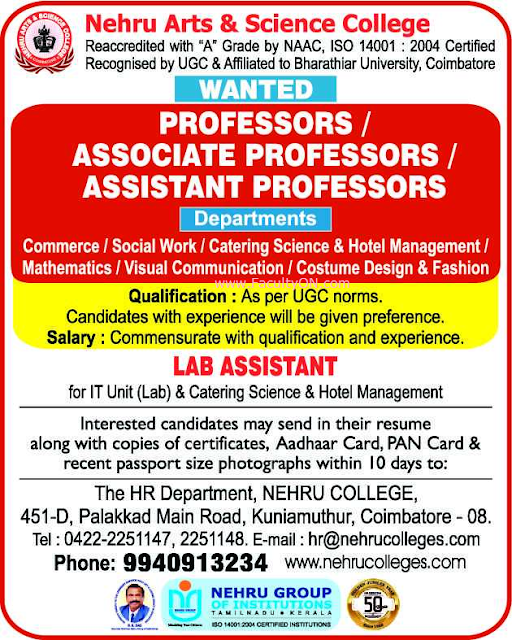 Nehru Arts and Science College, Coimbatore has advertised for recruitment of Teaching Faculty- Professor / Associate Professor / Assistant Professor Plus Lab Assistant jobs vacancies. Interested and eligible job aspirants are requested to apply within 10 days from 28th November 2018. Check out further more details below. About College: The College was established in 1998 offering 04 programmes with 54 students. It is affiliated to Bharathiar University, recognized by UGC with 2 (f) and 12 (B), certified with ISO 9001:2008 and ISO 14001:2004. NASC was accredited by NAAC with "B" Grade (CGPA 2.75) in 2009 and reaccredited with “A” Grade (CGPA 3.10) in 2014. Due to the consistent and conscious efforts of the Management and the Principal, in nurturing the Institution, it has grown in strength and achieved success over the years. The College has got Autonomous Status in July 2017. 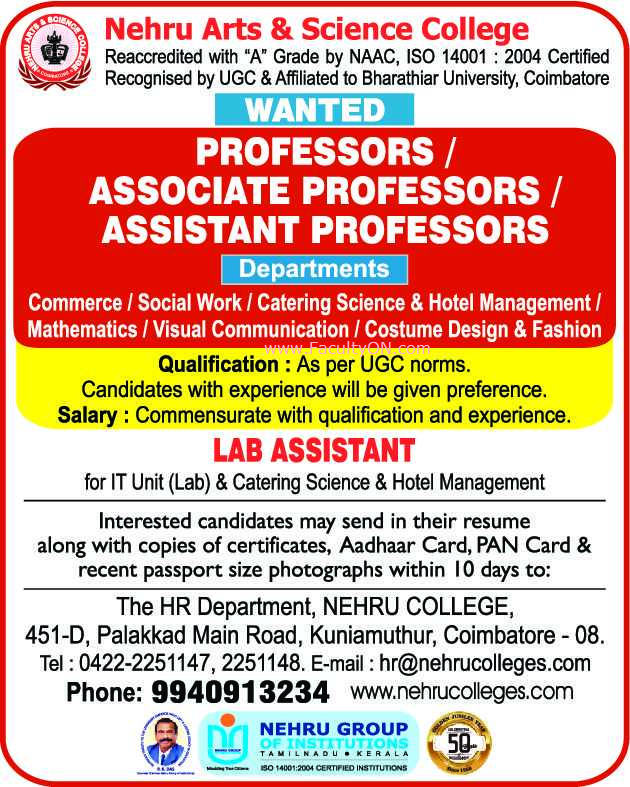 How to Apply: Interested and eligible candidates are requested to send detailed resume along with copies of certificates, PAN card, Aadhaar card and PP size photos to the email address or postal address given below.